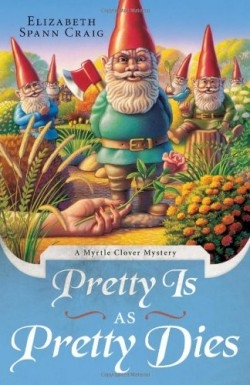 You can enjoy Elizabeth Spann Craig’s Pretty Is as Pretty Dies (Midnight Ink, 978-0-7387-1480-6) for the mystery, which centers on WHO BLUDGEONED the most hated woman in Bradley, North Carolina. You can also enjoy it for Myrtle Clover’s frequent collisions with nosy, talky Edna Sherman. Myrtle, a cranky octogenarian and retired teacher, is pretty nosy herself. The mother of the local police chief, Myrtle turns sleuth when unlikable Parke Stockard is murdered. She ends up solving the crime long after most readers will have deciphered some obvious clues. But that’s okay. The treat here is Myrtle’s eccentricity, brought to life with rich humor and executed for the most part with breezy skill.